Top features: - Watch the nation's most popular channels with Freeview HD - Stream amazing content on Netflix and Prime Video - Enjoy entertainment with a crisp picture & virtual surround sound Watch the nation's most popular channelsEnjoy the nation's top channels with the JVC LT-43C790 43" Smart LED TV. The built-in Freeview HD tuner lets you stay up to date with your favourite series from the likes of the BBC and ITV without signing up for a subscription. Don't worry if you miss that new episode the night it airs. Freeview Play lets you scroll up to one week back through the TV guide, so you can catch up on all your shows. Plus, you can check out loads of content on-demand on each channel's app.Stream amazing contentCheck out that Netflix series everyone's been talking about. The LT-43C790 includes streaming apps such as Netflix and Prime Video, so you can start binging.Twitter and Facebook are also available on the homepage, so you can share your thoughts on the series with your followers - no spoilers, though.Enjoy entertainmentGreat for the kids playroom, bedroom, or family room, the LED screen displays rich colours and sharp contrast for enjoying shows, sports, and games, while DTS TruSurround gets you fully immersed. ____________ Please note: Freeview and some apps & services are only available in the UK. Apps & services may be removed or no longer supported by third party content providers at any time. Some apps & services may not be available at launch and may require a firmware update before becoming available." We've found the Jvc LT43C790 once in our price comparison database. The price and product description is displayed. Prices include delivery charges as notified to us by the suppliers. Click the "buy now" button to open a new window and get more information from the supplier or to purchase the Jvc LT43C790. Jvc LT40C890 from £249.00. Top features: - 4K Ultra HD with HDR provides superb detail & brilliant colours - Freeview HD and Freeview Play lets you entertain the whole family - Catch up and stream in 4K with the JVC smart TV platform 4K Ultra HD with HDR The JVC LT-40C890 40" Smart 4K Ultra HD HDR LED TV is perfect for film fans, game-lovers and telly addicts. It has a 4K Ultra HD resolution - up to four times the resolution of HD TVs - which offers the very best detail when you're watching 4K content. HDR (High Dynamic Range) helps to bring out the depth of colour and brightness in scenes that help to make it closer to real life. It's perfect for seeing the detail hidden in dark gloomy scenes, or for enjoying the full spectrum of colour in a nature documentary. Freeview HD and Freeview Play You won't be stuck for what to watch with Freeview HD. It gives you access to 15 high definition channels, over 70 standard definition channels and over 25 radio stations, including some of the nation's favourite channels. It won't cost you a penny in subscriptions, so you can keep everyone happy without getting stuck in contracts. Fed up of missing your favourite drama? Freeview Play has the answer. It lets you scroll back through the TV guide and watch shows you've missed straight from the TV guide, without needing to launch catch up TV apps. Now you'll always know what's going on. Catch up and stream If you prefer to take a look through catch-up TV apps for inspiration, you've got the option thanks to BBC iPlayer, All 4, and other apps. You'll never be stuck for entertainment with 4K streaming on Netflix and Amazon Prime, giving you access to a whole host of TV series and movies to binge on. You can also stream the latest viral videos with YouTube 4K, or check what's going on with friends and followers on Facebook and Twitter. Effortless installation For setup without the squabbles, our Team Knowhow experts can connect your new TV to your Blu-ray player, sound bar, and other devices. They'll even get you online so you can put your feet up and start watching straight away. Pass the popcorn. Essential extras Want your TV wall mounted? No problem. We've got brackets that tilt, swivel, or fix your TV in place for the best viewing spot in the house. Alternatively, browse our range of TV stands - we've got enough designs to keep even the pickiest interior designer happy. Avoid the disappointment of getting your shiny new telly home and realising you don't have the cable you need to connect your games console or Blu-ray player. Sandstrom Gold Series HDMI cables support all resolutions and come with a reassuring lifetime guarantee.____________________________________________Please note: Freeview and some apps & services are only available in the UK. Apps & services may be removed or no longer supported by third party content providers at any time. Some apps & services may not be available at launch and may require a firmware update before becoming available. Hisense H43A6200UK from £279.00. Top features: - Ultra HD 4K screen for incredible picture quality - Audio enhancements match the visuals - Vidaa U gives you a range of smart content - Take control with the RemoteNOW app Ultra HD 4K screenThe Hisense H43A6200UK 43" Smart 4K Ultra HD HDR LED TV shows all your favourite entertainment in amazing quality. HDR technology brings the most out of all the colours on your screen, and HDR10 provides high contrast, for deep and dark blacks. So whether the kids are watching a colourful cartoon or you're settling down with a moody drama, everything will look great.And even when you're not watching 4K TV, your Hisense H43A6200UK TV will upscale your entertainment so even older content will look better than ever. Dig out a DVD, hook up your player and watch a boxset the classic way. You can even plug a USB stick in and watch downloaded media files. Audio enhancementsWith a 4K TV you need audio that sounds as good as the picture looks. The Hisense features Total Sonics for clarity and dynamic bass boost, Total Volume for consistent volume that sounds the same across different media, and Total Surround for an immersive entertainment experience.Vidaa UCan't find anything to watch? The H43A6200UK uses Vidaa U to connect you to a range of smart content. Load up Netflix and Amazon Video to watch the latest must-see shows, or just catch up on terrestrial favourites with BBC iPlayer, ITV Hub, All 4 and more. And with Freeview Play giving you a full 7-day programming guide, you can even pause and rewind live TV.Take controlDownload the RemoteNOW app to your smartphone and take control of your TV without hunting for the remote. You can even cast media from your smartphone over to your TV, so you can laugh at that funny video you've been sent on the big screen.Effortless installationFor setup without the squabbles, our Team Knowhow experts can connect your new TV to your Blu-ray player, sound bar, and other devices. They'll even get you online so you can put your feet up and start watching straight away. Pass the popcorn.Effortless installationFor setup without the squabbles, our Team Knowhow experts can connect your new TV to your Blu-ray player, sound bar, and other devices. They'll even get you online so you can put your feet up and start watching straight away. Pass the popcorn.Essential extrasWant your TV wall mounted? No problem. We've got brackets that tilt, swivel, or fix your TV in place for the best viewing spot in the house. Alternatively, browse our range of TV stands - we've got enough designs to keep even the pickiest interior designer happy.Avoid the disappointment of getting your shiny new telly home and realising you don't have the cable you need to connect your games console or Blu-ray player. Sandstrom Gold Series HDMI cables support all resolutions and come with a reassuring lifetime guarantee. ____________________________________________ Please note: Freeview and some apps & services are only available in the UK. Apps & services may be removed or no longer supported by third party content providers at any time. Some apps & services may not be available at launch and may require a firmware update before becoming available. Jvc LT43C890 from £299.00. 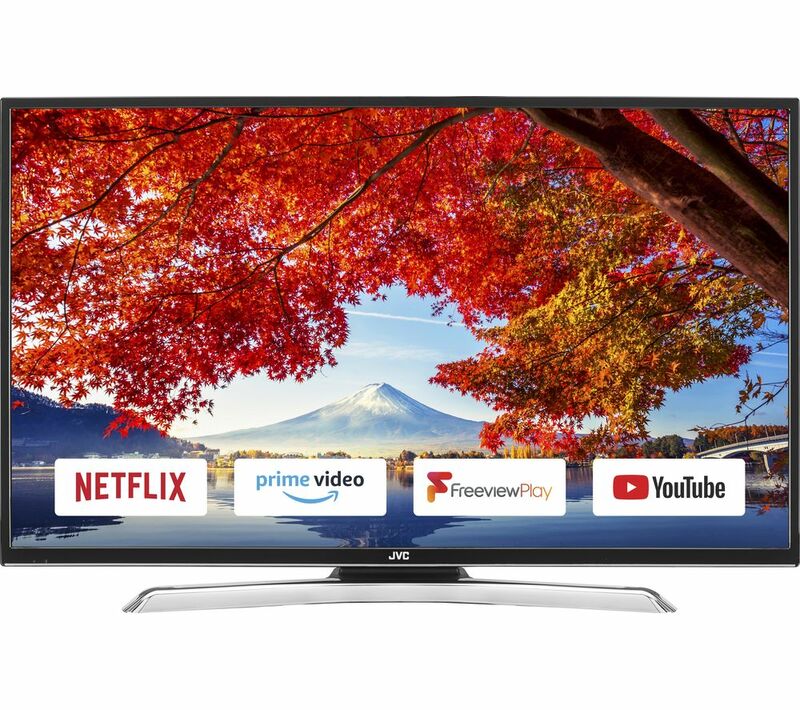 Top features: - 4K Ultra HD with HDR provides superb detail & brilliant colours - Freeview HD and Freeview Play lets you entertain the whole family - Catch up and stream in 4K with the JVC smart TV platform 4K Ultra HD with HDR The JVC LT-43C890 43" Smart 4K Ultra HD HDR LED TV is perfect for film fans, game-lovers and telly addicts. It has a 4K Ultra HD resolution - up to four times the resolution of HD TVs - which offers the very best detail when you're watching 4K content. HDR (High Dynamic Range) helps to bring out the depth of colour and brightness in scenes that help to make it closer to real life. It's perfect for seeing the detail hidden in dark gloomy scenes, or for enjoying the full spectrum of colour in a nature documentary. Freeview HD and Freeview Play You won't be stuck for what to watch with Freeview HD. It gives you access to 15 high definition channels, over 70 standard definition channels and over 25 radio stations, including some of the nation's favourite channels. It won't cost you a penny in subscriptions, so you can keep everyone happy without getting stuck in contracts. Fed up of missing your favourite drama? Freeview Play has the answer. It lets you scroll back through the TV guide and watch shows you've missed straight from the TV guide, without needing to launch catch up TV apps. Now you'll always know what's going on. Catch up and stream If you prefer to take a look through catch-up TV apps for inspiration, you've got the option thanks to BBC iPlayer, All 4, and other apps. You'll never be stuck for entertainment with 4K streaming on Netflix and Amazon Prime, giving you access to a whole host of TV series and movies to binge on. You can also stream the latest viral videos with YouTube 4K, or check what's going on with friends and followers on Facebook and Twitter. Effortless installation For setup without the squabbles, our Team Knowhow experts can connect your new TV to your Blu-ray player, sound bar, and other devices. They'll even get you online so you can put your feet up and start watching straight away. Pass the popcorn. Essential extras Want your TV wall mounted? No problem. We've got brackets that tilt, swivel, or fix your TV in place for the best viewing spot in the house. Alternatively, browse our range of TV stands - we've got enough designs to keep even the pickiest interior designer happy. Avoid the disappointment of getting your shiny new telly home and realising you don't have the cable you need to connect your games console or Blu-ray player. Sandstrom Gold Series HDMI cables support all resolutions and come with a reassuring lifetime guarantee. ____________________________________________ Please note: Freeview and some apps & services are only available in the UK. Apps & services may be removed or no longer supported by third party content providers at any time. Some apps & services may not be available at launch and may require a firmware update before becoming available. Logik L43UE19 from £279.00. Top features: - Superb colour and detail with Ultra HD resolution and HDR - Stream the shows you love with Netflix, Prime and Freeview Play - Enjoy crisp and clear, audio with DTS TruSurround and Dolby Digital Plus Superb colour and detailMake movie nights even better with the Logik L43UE19 43" Smart 4K Ultra HD HDR TV. With a 4K resolution, the Logik L43UE19 displays sharper images in greater detail, making every picture look more realistic.Combined with HDR10, the TV is able to show off the brightest colours and darkest shades in the same frame. That means you'll see everything, even in dimly lit dialogue scenes or tension-building horror films.Stream the shows you loveYou'll always find something to watch on the Logik L43UE19 TV. Stream that documentary everyone's talking about in 4K on Netflix, or check out that exciting new drama on Amazon Prime. With the app store, YouTube, and social media apps, you'll never run out of ways to stay entertained.And if you weren't in to see the season finale of your favourite show, or missed the big game, Freeview Play lets you catch up with shows that have broadcasted over the past seven days straight from the TV guide. So, you'll always be up to date.Enjoy crisp and clear, enveloping audio Don't let a beautiful picture go unmatched with flat audio. The Logik L43UE19 uses DTS TruSurround and DTS HD to provide a virtual surround sound experience that pulls you even further into what you're watching. And if you already have a home cinema setup, Dolby Digital Plus has you covered with crisp, detailed audio that can support 7.1 channel speaker systems.____________________________________________Please note: Freeview and some apps & services are only available in the UK. Apps & services may be removed or no longer supported by third party content providers at any time. Some apps & services may not be available at launch and may require a firmware update before becoming available.